We will discuss aspects of optimization of mobile crowd-sensing and online platforms such as recommender systems and online advertising systems. In the first part of the talk, we study optimization of mobile crowd-sensing campaigns in terms of total expected quality for a set of tasks to be accomplished, and in terms of compensation cost to task contributors. We profile users with respect to the impact of different task attributes on their decision-making by drawing on logistic-regression techniques from machine learning to learn from past data and then perform incentive targeting. In the second part of the talk, we take a first step towards rethinking recommender systems by exploiting the expected social-network diffusion and withholding recommendation of items that will anyway reach a user through reposting. We formulate the problem of maximizing total user engagement as a post allocation problem and evaluate our approach through real datasets. In the last part of the talk, we discuss native advertisement selection and allocation in online user feeds with the aim to maximize total expected profit for the online platform, which depends on the profit per click and the click probability. In our model, click probability depends on the relevance of the ad to the preceding post, and on the distance between consecu- tively projected ads; i.e., the fewer the intervening posts between two ads, the smaller the click probability is, due to user saturation. We show that the problem is equivalent to different versions of the min-cost path problem, depending on problem constraints. We conclude with a high-level overview of few other research areas and challenges that shape our research agenda. Iordanis Koutsopoulos is an Associate Professor at the Department of Informatics of Athens University of Economics and Business (AUEB) in Athens, Greece. He received the Diploma degree in Electrical and Computer Engineering from the National Technical University of Athens (NTUA), Greece, in 1997 and the M.Sc. and Ph.D. degrees in Electrical and Computer Engineering from the University of Maryland, College Park (UMCP), MD, USA, in 1999 and 2002, respectively. 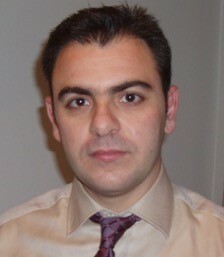 He has served as Assistant Professor (2013-2016) with AUEB, and Assistant Professor (2010-2013) and Lecturer (2005-2010) with the Department of Electrical and Computer Engineering, University of Thessaly. He received the single-investigator European Research Council (ERC) competition runner-up award for the project RECITAL: Resource Management for Self-coordinated Autonomic Wireless Networks (2012-2015). He is a senior member of IEEE. His research interests are in the general area of network control and optimization, with applications in mobile crowdsensing, wireless networks, social networks, online platforms, smart energy grid and cloud computing systems.